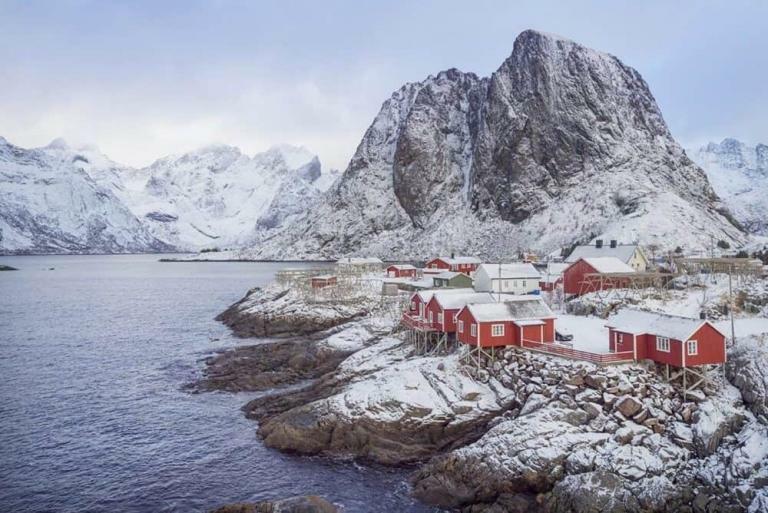 It’s a regular stopover destination for many doing the long haul leg between Europe and Australia/Asia and boasts various neighbourhoods, gardens and architectural wonders. 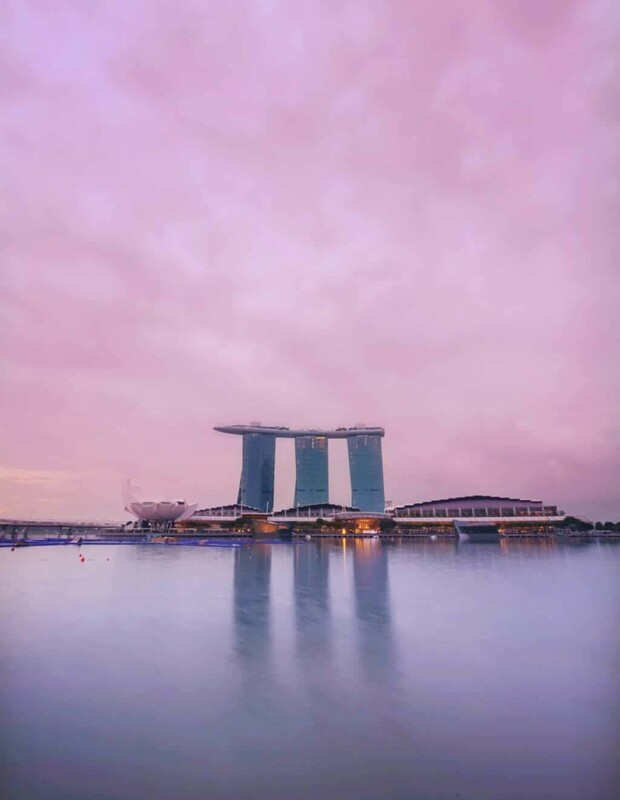 For travel photographers, Singapore offers a variety of scenes and landscapes to capture, so many in fact that you can keep yourself busy from sunrise to sunset then continue shooting nightscapes well into the evening. 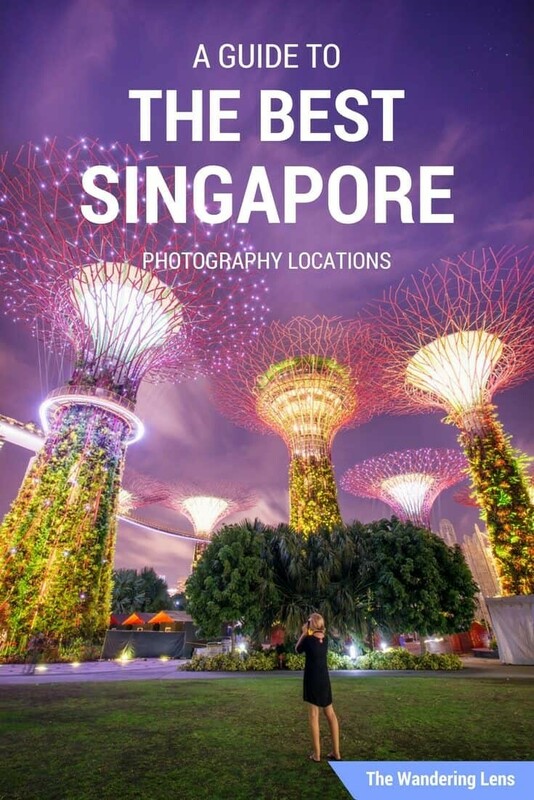 Below you’ll find a guide to the best photography locations in Singapore, giving you the pick of the photogenic places for your next visit to this fascinating city. Singapore Photography Location Map: Scroll to the bottom of this guide to view a map which lists all the locations mentioned and enables you to open it up and follow with Google Maps on your travels! Singapore One Day Itinerary: Before we get started, if you’re visiting Singapore soon, take a peek at my brand new itinerary for photographers, listing where to go and when to make the most of your day from 8am-8pm – including transport details + walking info. 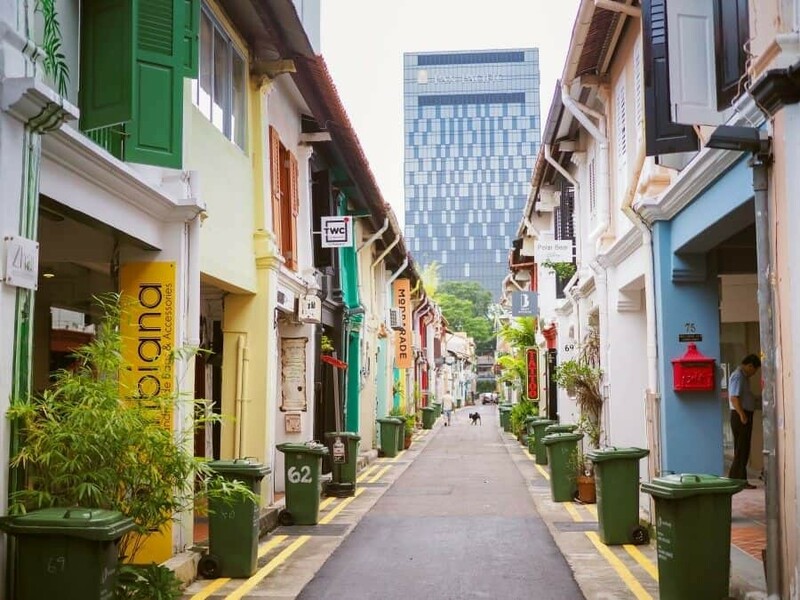 This heritage rich neighbourhood is my pick of places to go and experience a different side of Singapore. It’s a little like stepping back in time yet it’s also clear Tiong Bahru is one very happening part of town. Trendy cafes, boutiques and patisseries are popping up beside the more traditional Tiong Bahru Market. 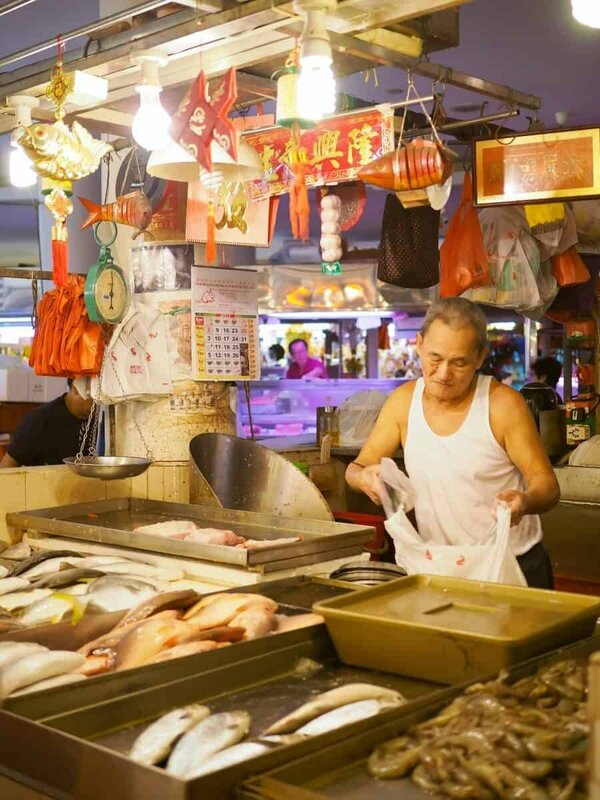 The streets of Tiong Bahru are like a zen garden in comparison to Orchard Rd however inside the market you’ll find a hive of local interaction as people come to buy flowers, fruit and fresh fish. 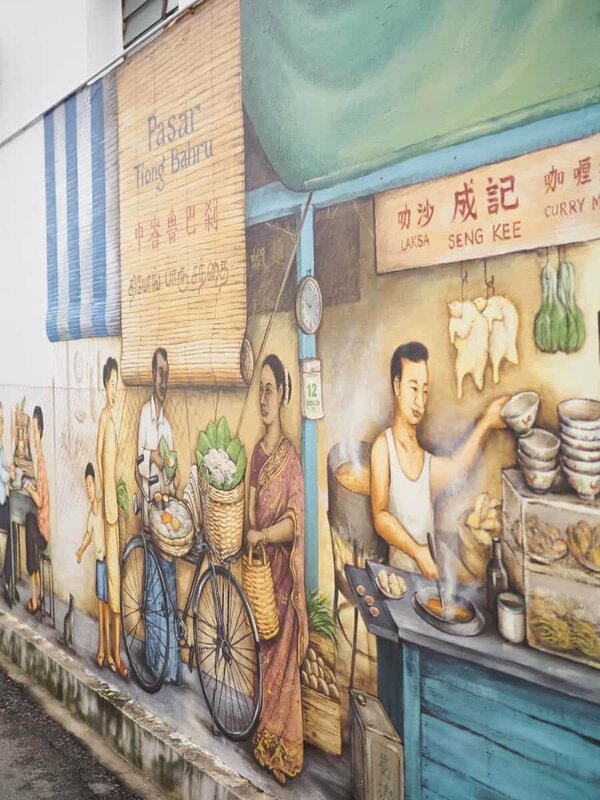 Tiong Bahru is well known for murals with history depicted in a series of beautifully painted scenes that adorn the walls of alleys and building facades. The murals tell stories of the past with descriptions also written alongside each scene. 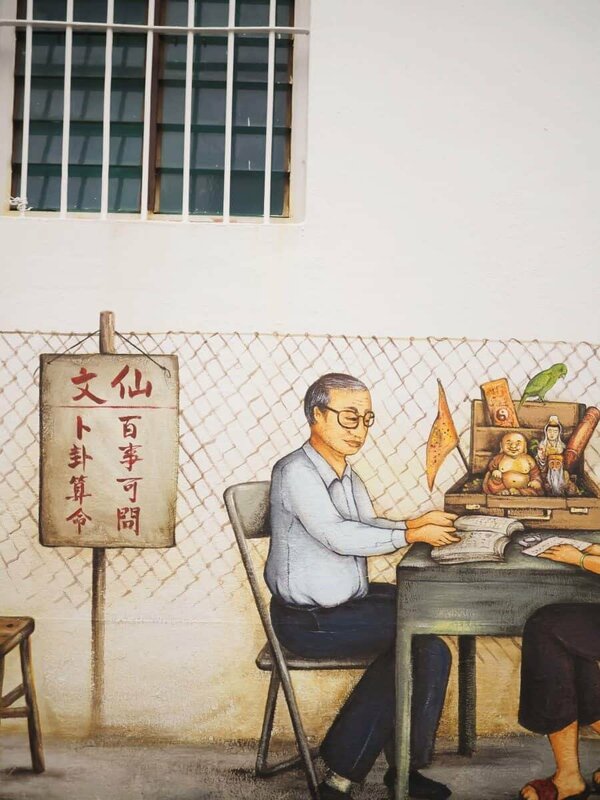 You’ll find a map to the murals located above…my favourite was the Bird Singing Corner, where local bird lovers once brought their pets to sing and chirp. Singapore Photo Tip: This is a great place to test out your creative composition, read more about how to add creativity into your photography here. Getting Here: Take the MRT to Tiong Bahru Station (EW17) which is located on the East West Line (Green) or catch a bus to get dropped off right by the Tiong Bahru Market. It’s like the movie Avatar was blended with a Christmas tree and grew into a sparkling forest of all things magical. 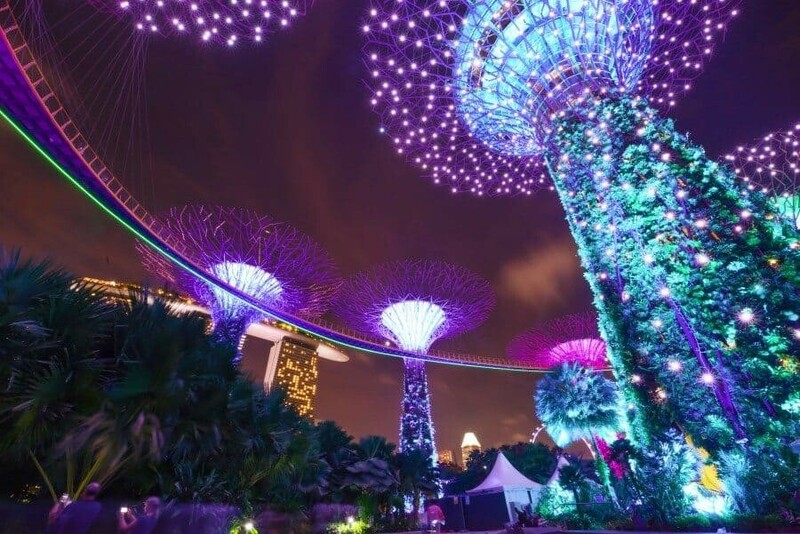 Even as a fully grown adult (who loves fairy lights) the Supertree Grove makes you stare in wonder at the world that’s been created here making it one of the best photography places in Singapore. It’s best to visit during the evening so you get the full effect of the coloured Supertrees in their full splendour. Be sure to take along a wide-angle lens so you can stand beneath the huge structures and fit them all into the frame. There’s a lot of angles you can capture here so allow yourself enough time to wander around the grove and photograph from various angles. 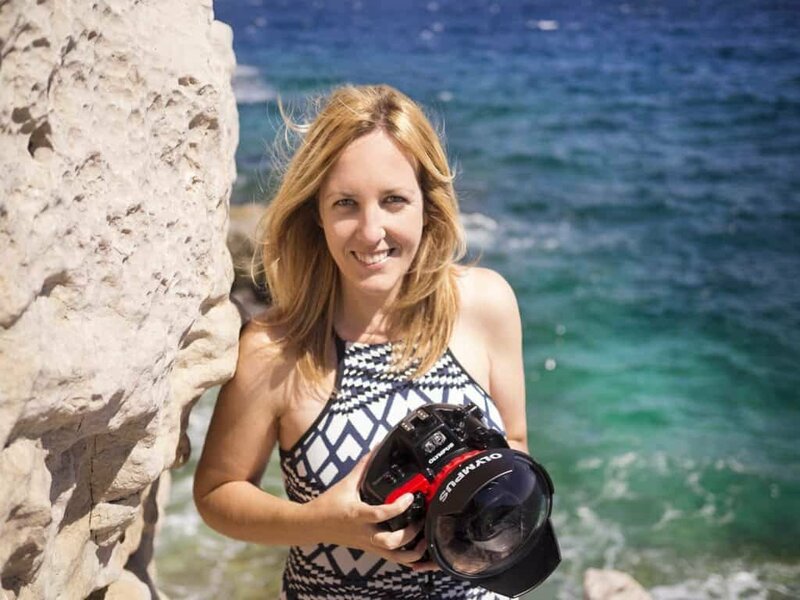 Read my other article about 7 Ways to Improve your Travel Photography here. Marina Bay Sands is the closest hotel to the Supertree Grove, it’s also the famous hotel with the skydeck pool that looks over the city! Getting Here: You’ll find the Supertree Grove just near Marina Bay Sands. You can access via the Bayfront MRT station located on the Downtown and Circle lines. There’s a great viewpoint across the lake when walking from the MRT station so avoid the charge of catching a shuttle to the entrance and wander ten minutes for more great vantage points. 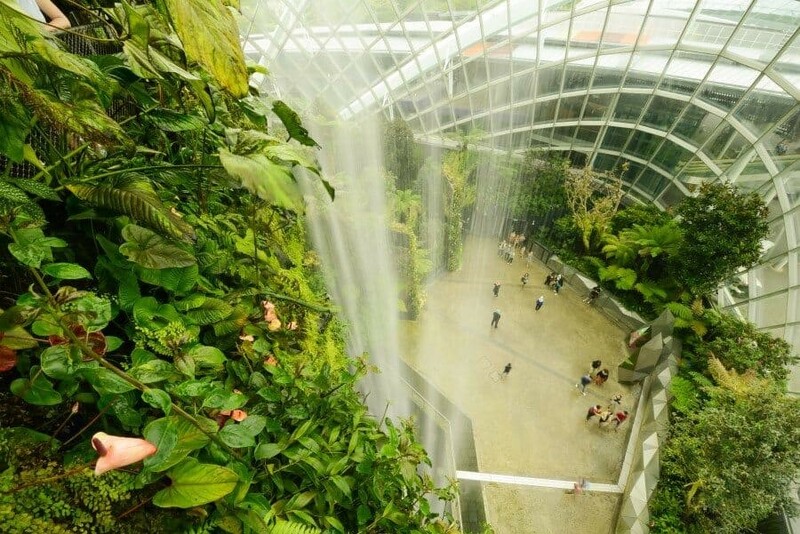 Imagine a six storey waterfall housed in a dome of lush rainforest that you can explore whilst still seeing the sights of Singapore through the windows…welcome to the Cloud Forest. 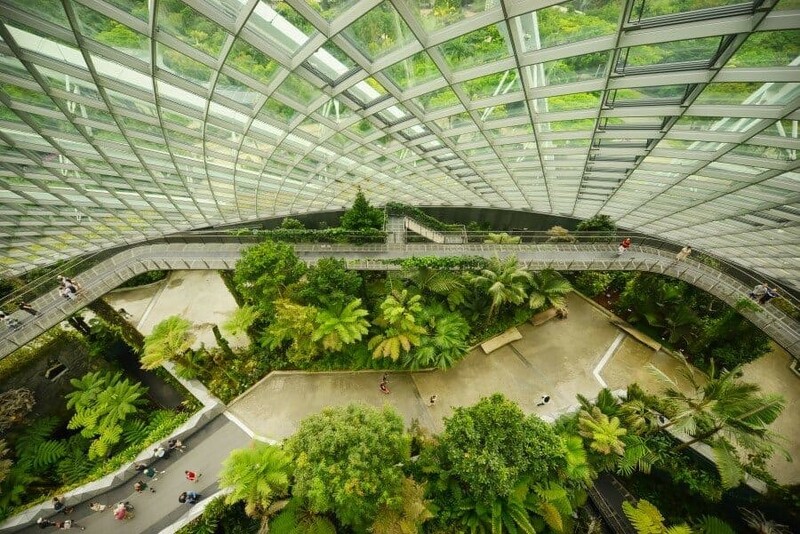 Singapore impresses yet again with innovation in creating this dreamy indoor forest. Like entering the land before time it’s a mist filled dome that’s home to rare plants and so much green goodness! Switch your camera to ‘cloudy’ white balance to bring out the rich colours and take a little cloth because you’ll no doubt get condensation or droplets of mist on your lens. Getting Here: It’s just beside the Supertree Grove and Marina Bay Sands so you can access via the Bayfront MRT station. Admission is $16 for adults or if you also want to access the Flower Dome next door it’s $28 for both conservatories. The Cloud Forest is open from 9am-9pm daily. I never knew this location existed on previous visits to Singapore and I’m so glad I found it on my recent trip. 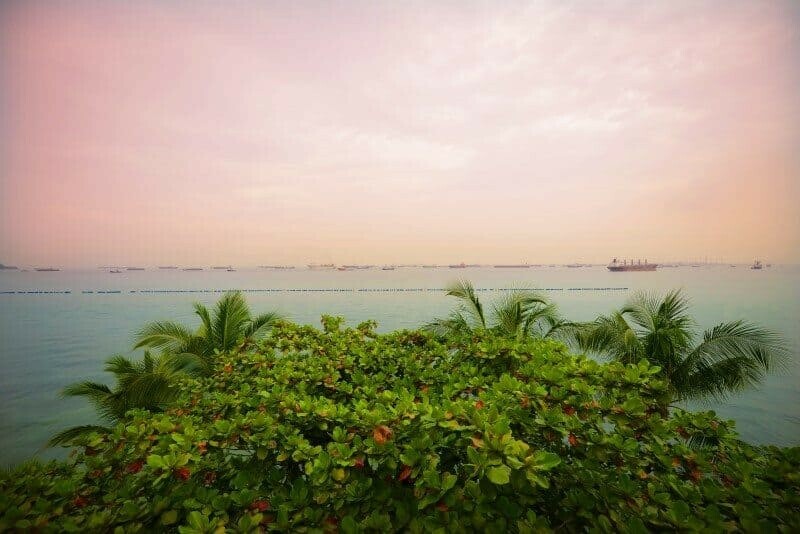 It has possibly the best view back towards Singapore with a skyline that includes all of the highlights from east to west. Marina Barrage is a popular spot for locals to enjoy picnics and also fly kites, a great subject to include in your photos! 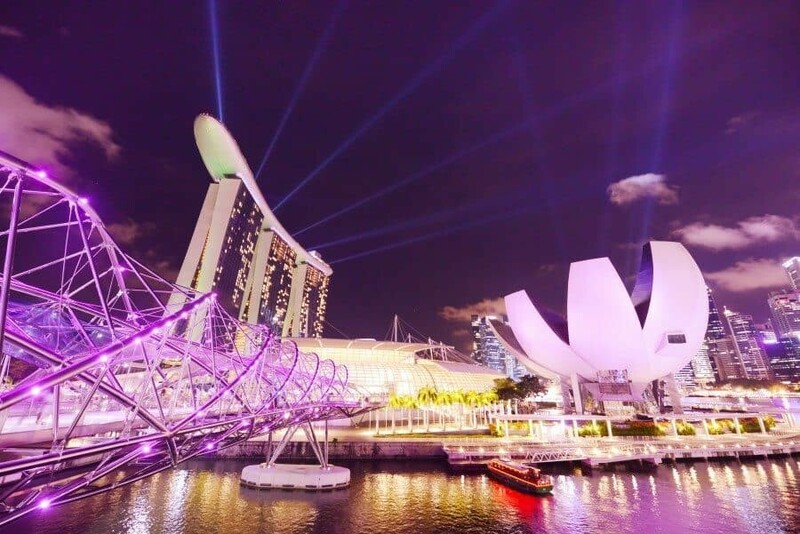 On the tip of the grassy area on the top level is a corner almost built for your tripod that enables you to capture the perfect panoramic shot of Singapore. It’s a great spot for plane spotters too and to catch the light show of Marina Bay Sands from a different vantage point. 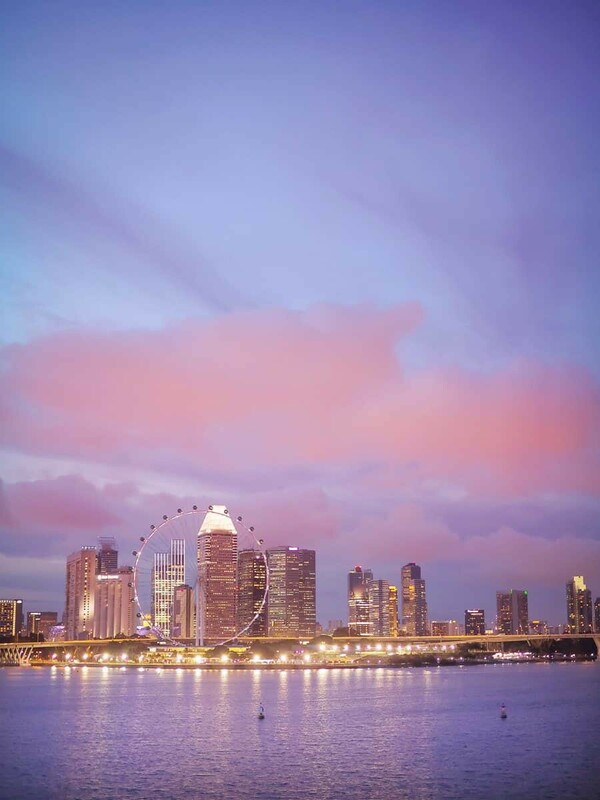 Singapore Photo Tip: Spend Golden Hour here shooting the sun setting across the city. Check out some tips about how to work with low light and golden hour here. Getting Here: You can take Bus #400 from downtown or a taxi which will cost roughly $10. 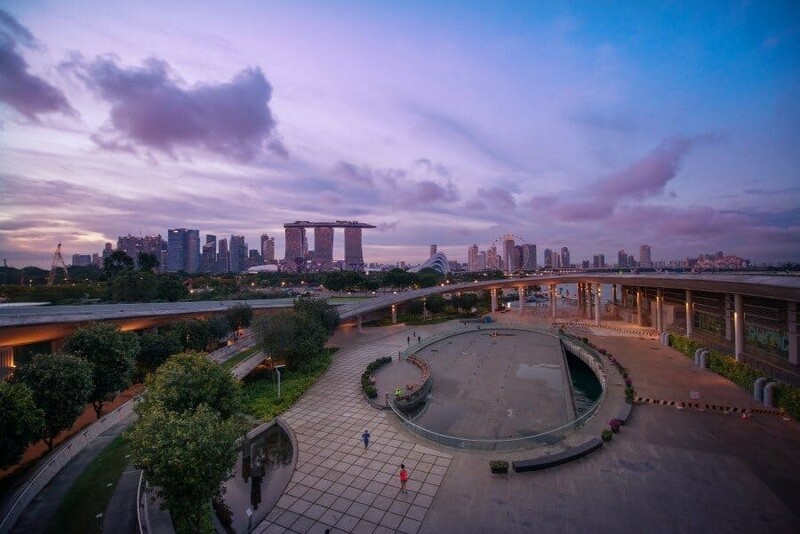 From Marina Barrage you can then walk along the waterfront toward the Singapore Supertree Grove…a great walk to do at dusk after you’ve watched sunset fall over the city from Marina Barrage. From appearance, it’s hard to believe this temple was only built in 2007…it’s snazzy and new compared to most Buddhist temples yet retains that charm so evident in Tang Dynasty architecture. 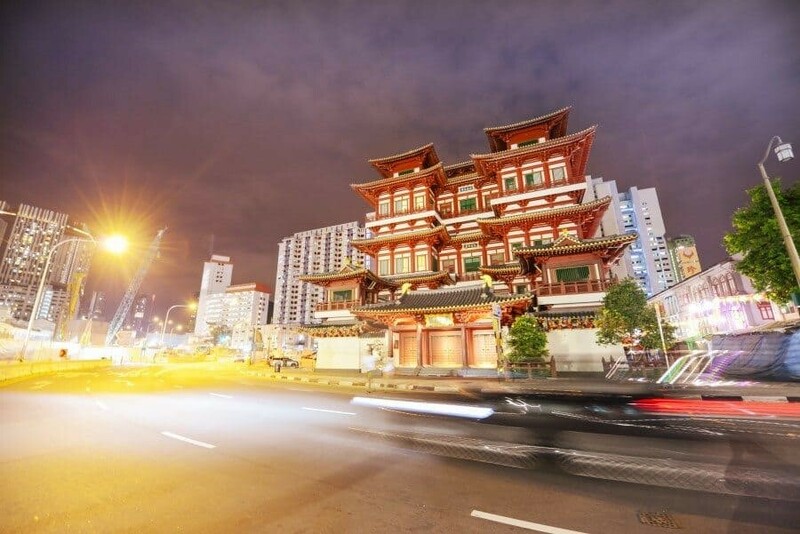 Located on the edge of Chinatown, it’s fast become a popular site for visitors and during the evening its imposing presence is a magnet for long exposure shots. Admission into the temple is free of charge and inside you’ll find a hall of 100 Buddha statues in the Hundred Dragons Hall and a Universal Wisdom Hall…I’m waiting to see if visiting the wisdom hall means eternal brilliance? While you can enter the complex during the day, I’d suggest a wander at night when the area is a little more quiet and you can explore the architecture and exterior details of one of the best photography places in Singapore. 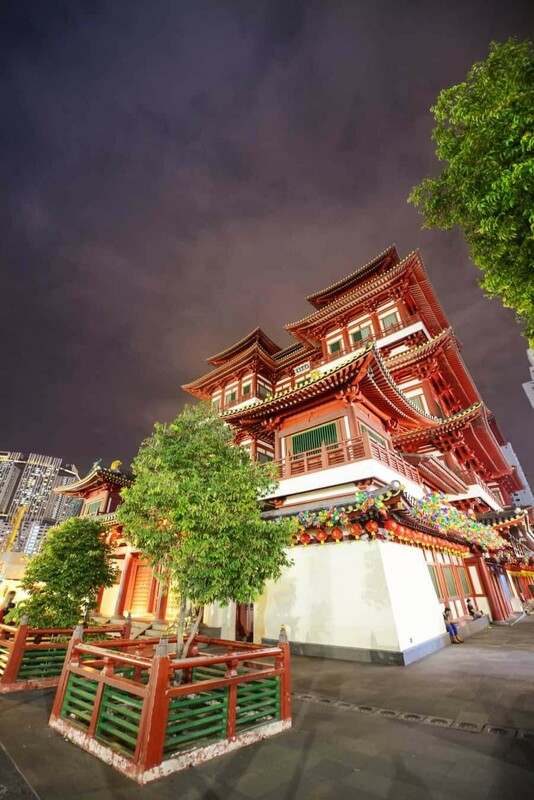 Getting Here: Located in Chinatown, the Buddha Tooth Relic Temple is a short walk from the Chinatown MRT Station. 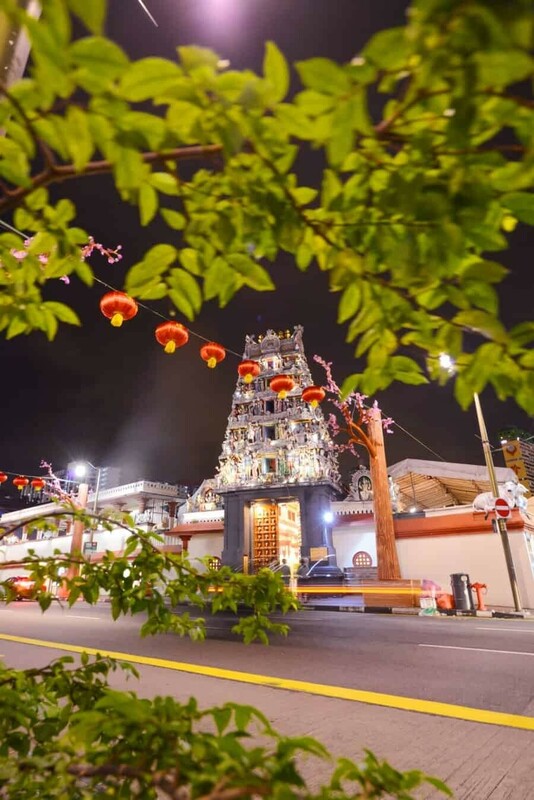 The official address is 288 South Bridge Road which is the road that connects directly back to Clark Quay and passes the Sri Mariammam Temple if you’re keen for a walk. Also off topic but if you’re keen for good Chinese in Chinatown, Fatty Weng Restaurant is GOOD! Just located around the corner from the temple! 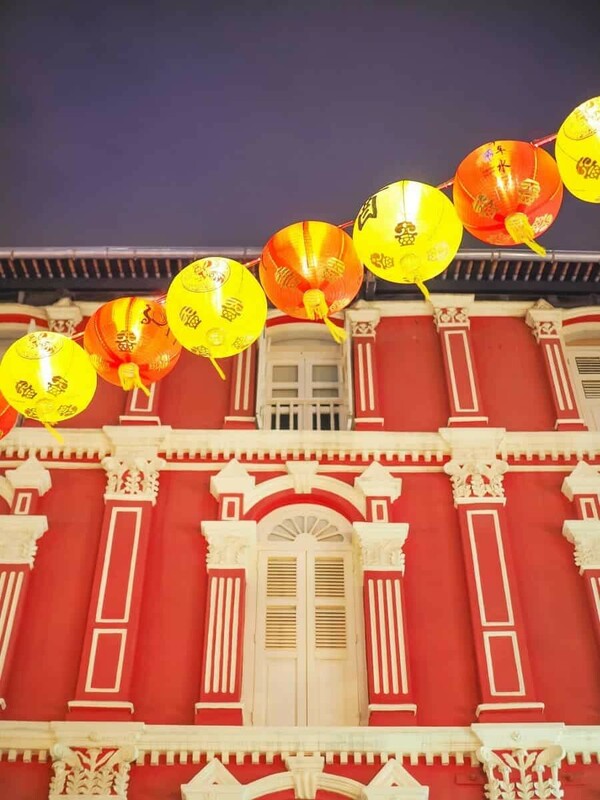 You’ll be seeing red from the moment you arrive in Chinatown with hanging lanterns and decorations as far as the eye can see at one of the best photography locations in Singapore. 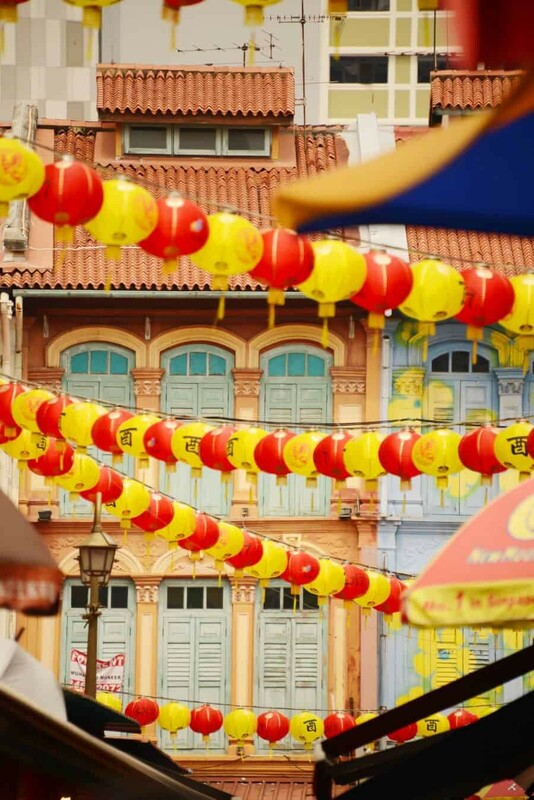 Singapore’s Chinatown is a celebration of culture and tradition. Market stalls sell anything and everything, cafes and restaurants follow the same anything goes mantra and you’ll find everyone there regardless of the time of day. It’s busy, alive and filled with photo opportunities of street scenes and colourful facades. 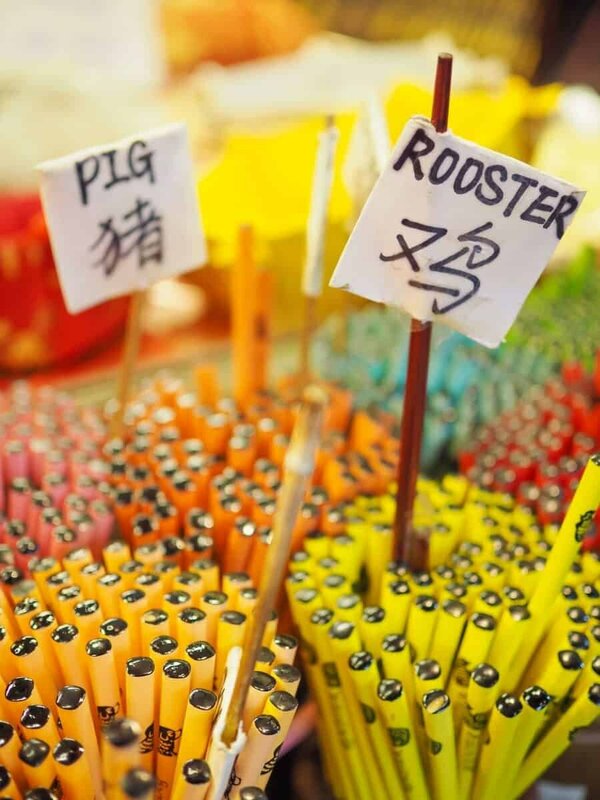 Getting to Chinatown in Singapore: It’s a nice walk from Clark Quay or you can jump on the MRT to Chinatown Station which sits on the blue Downtown and purple North-East Lines. Be aware that there are many exits from the Chinatown Station so head for Temple or Pagoda Street to arrive in the thick of the fun. 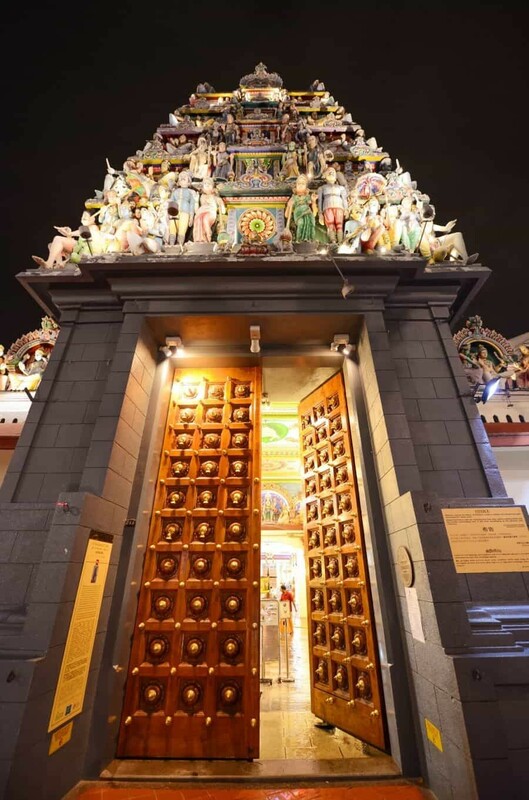 As the oldest Hindu temple in Singapore, Sri Mariammam is an elaborate gem and national monument, one that’s worth a visit with your camera. From the street you’ll find extensive detailing above the grand entrance with mythological beasts and sculptures all coloured brightly. If you’re in town during October and November you can watch a fire walking ceremony called Theemithi which is an annual celebration held at the temple. Getting Here: Located on South Bridge Road you can walk here from Clark Quay or take the MRT to Chinatown station. If you opt for the MRT, exit towards Pagoda Street and then wander to the end until you find the temple. 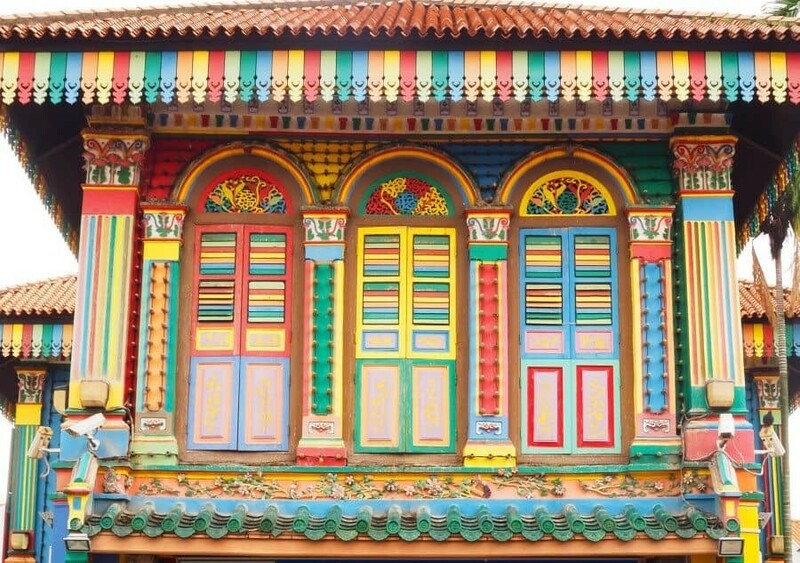 Bursting with colour, Little India is exactly what you imagine. Vibrant floral garlands hang in store fronts, streets are bustling with activity and the Indian culture is visibly evident. Street photographers will be very content with the opportunities in this area of Singapore. 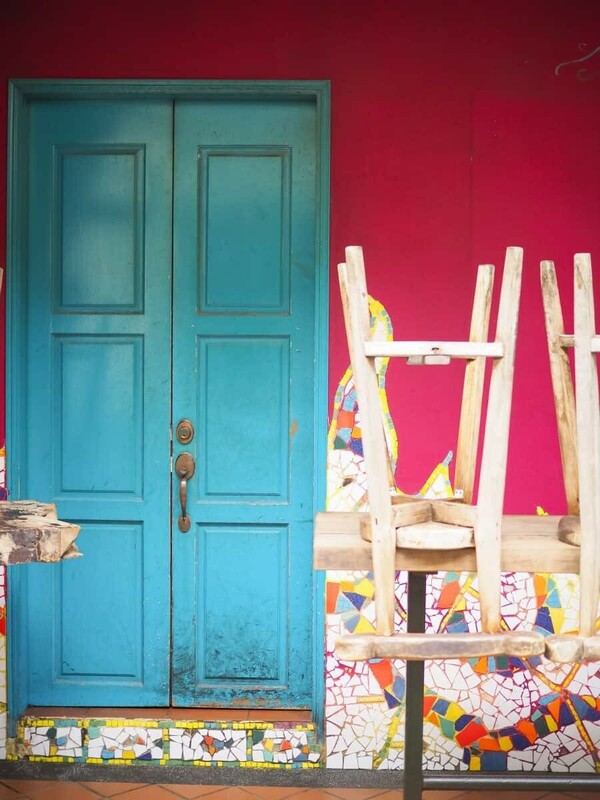 If you’re after colour, head straight for the House of Tan Teng Niah which dazzles with bold hues from the roof top down to the pavement. 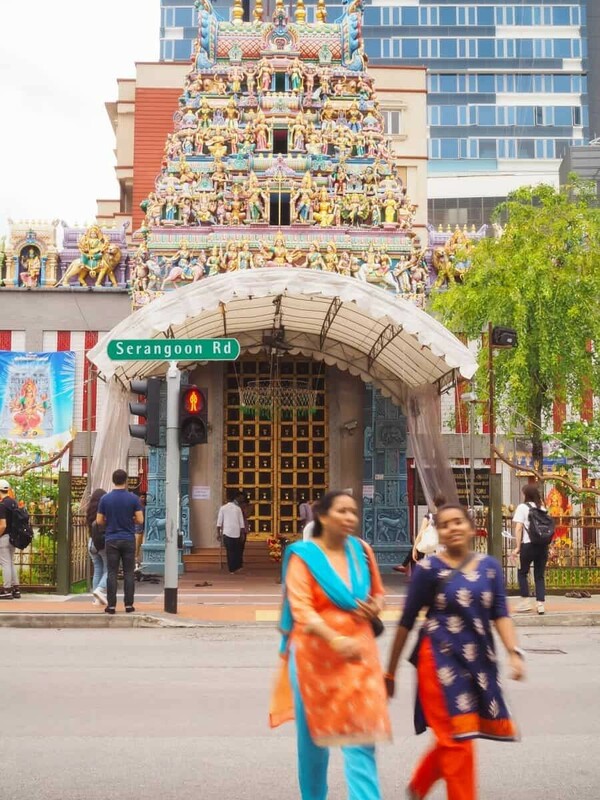 Sri Veeramakaliamman temple is another stand out in Little India, a great shot can be taken from across the street on on Sarangoon Road to capture the ornate detailing of this Hindu temple. 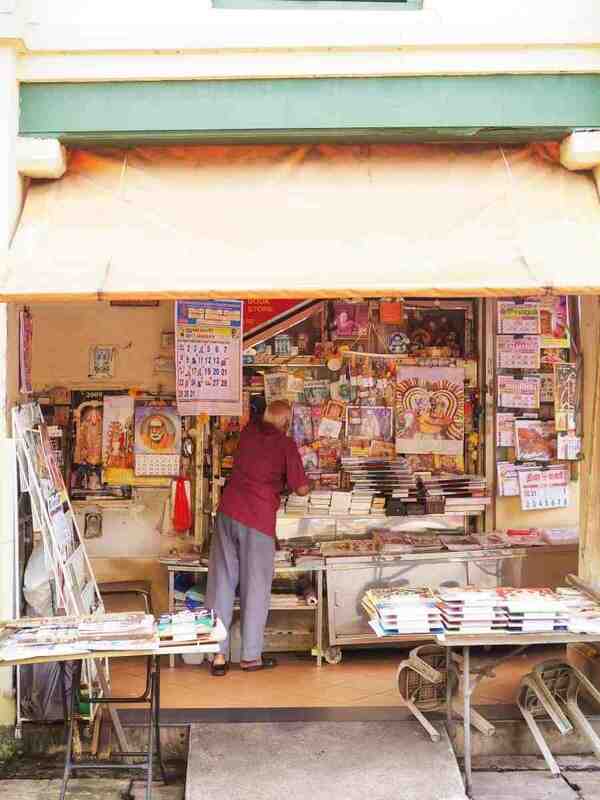 Singapore Photo Tip: Little India and also Chinatown (and most of Singapore actually!) are ideal for capturing portraits. Be sure to either ask permission or be mindful that people may not like their photo being taken but have fun capturing the essence of these communities. Read more about ‘How to Take Cultural Portraits‘ here. Getting Here: Little India has its own station on the blue Downtown and purple North-East MRT lines. It’s then just a matter of wandering through the streets with your camera and soaking up the culture and street scenes! I’ve included the direct location of the House of Tan Teng Niah in the map at the top of the guide. 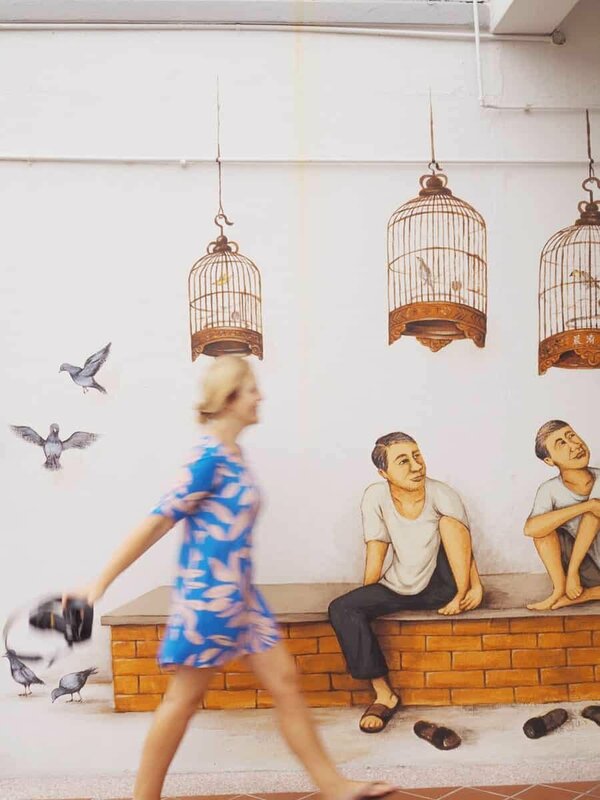 A known spot for Instagrammers and street photographers, Haji Lane is a narrow street lined with painted murals and street art. Personally I wasn’t wowed by Haji Lane but that could’ve been because I went in the morning and everything was closed…it’s probably best to go when it’s open and live. If you happen to be in the area it has great street art, cafes and little boutiques in some trendy fashion shophouses. If you’re into fashion/Instagram photography it’s a great spot to use some unique backgrounds in your portraits. 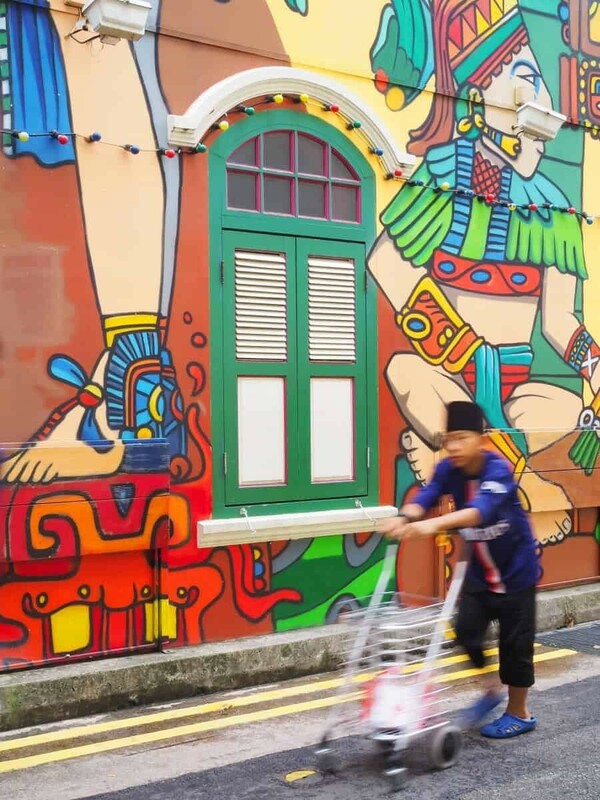 Getting Here: You’ll find Haji Lane in the Kampong Glam neighbourhood nestled between North Bridge and Beach Road. It is super tiny so don’t be shocked if you walk past the entrance, it’s within walking distance of Raffles too. 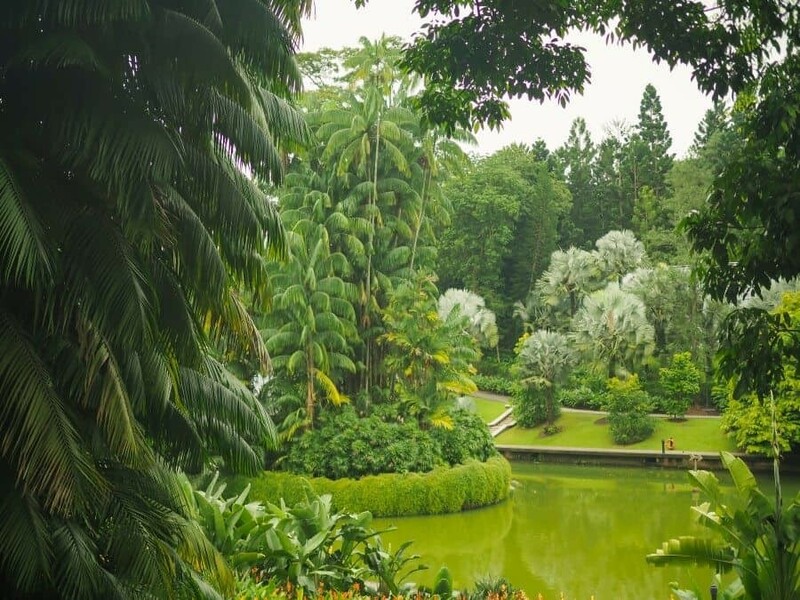 Green, green and more lush greenie goodness is waiting for you inside the Singapore Botanic Gardens. 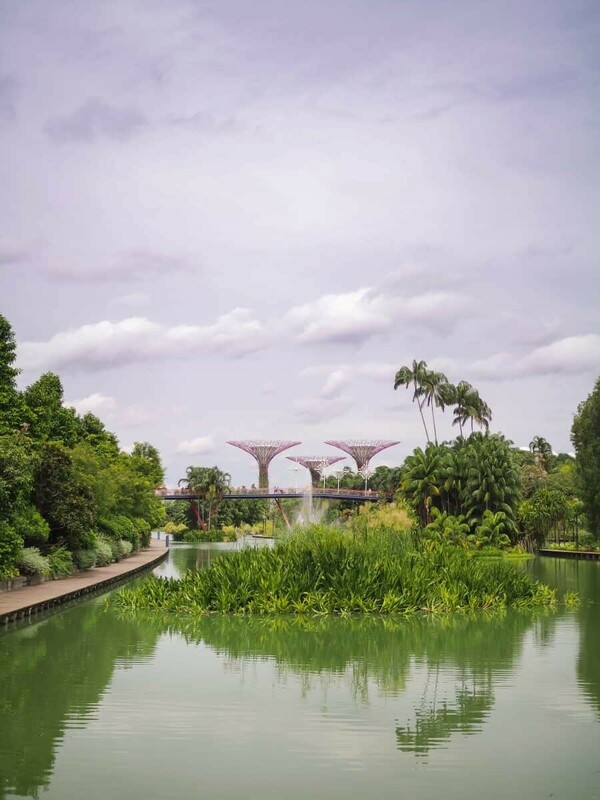 Being a humid destination, gardens simply flourish in Singapore and the botanic gardens are an alluring example is what’s possible. 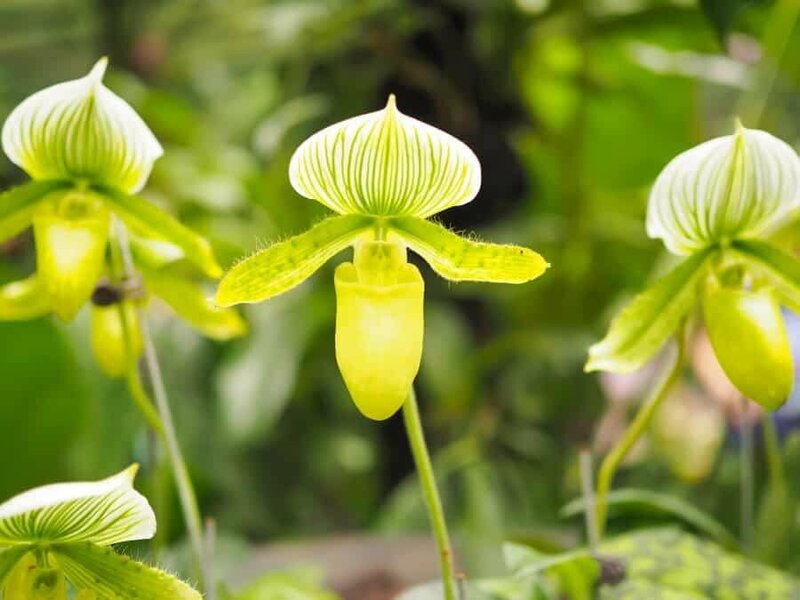 Giant canopies hang over manicured gardens filled with so many plant species you’ll find it hard to see which leaf belongs to which plant. Lakes, pagodas, rainforests and parks combine to offer hectares of photography potential. 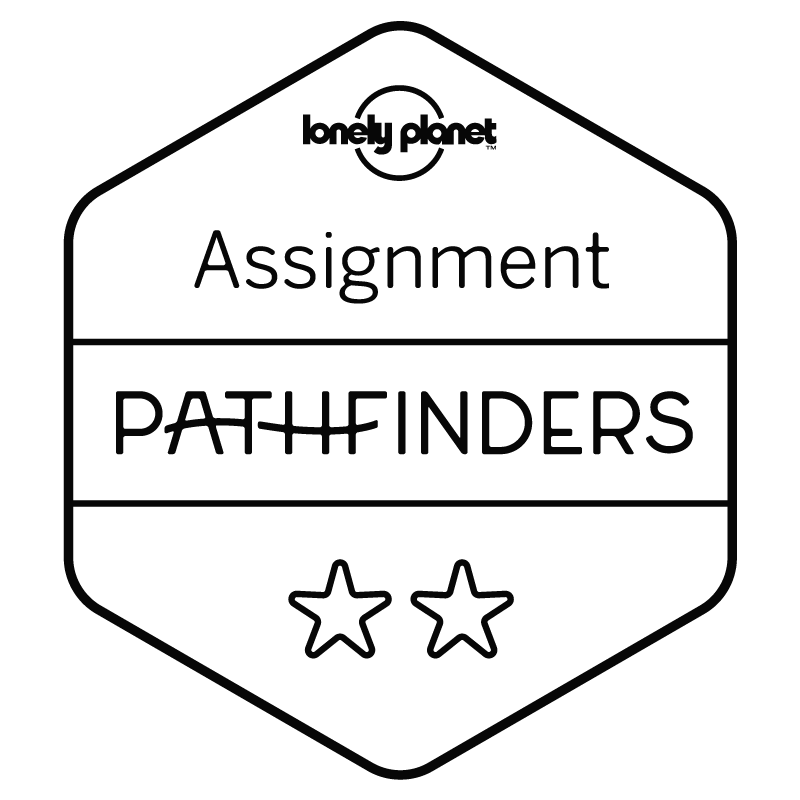 If you’ve ever wanted to master the art of shady/forest photography, this is the place to do it. 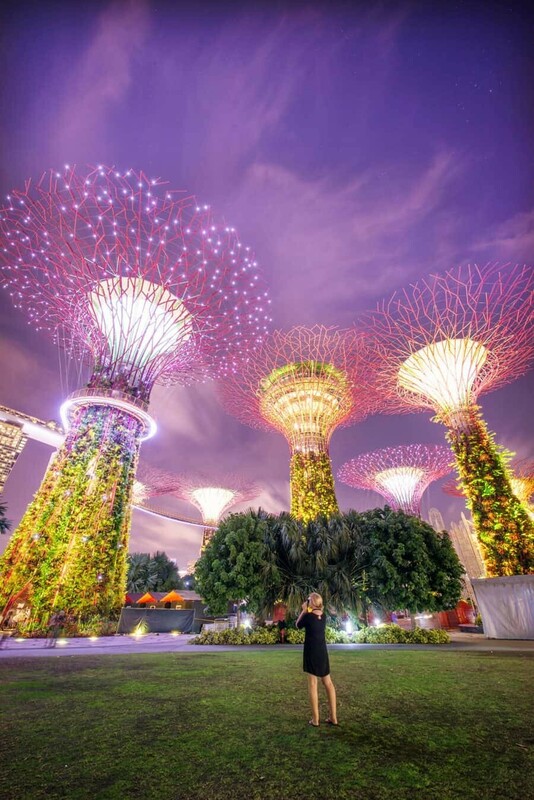 For fashion and portrait photographers, this is a beautiful photo spot for a Singapore photoshoot! Getting Here: The gardens have their own MRT station located on the Circle and Downtown Lines, it’s free admission. They’re also just a short walk from Orchard Road, Singapore’s popular shopping street. Never before have I seen such an overwhelming array of crazy beautiful plants. 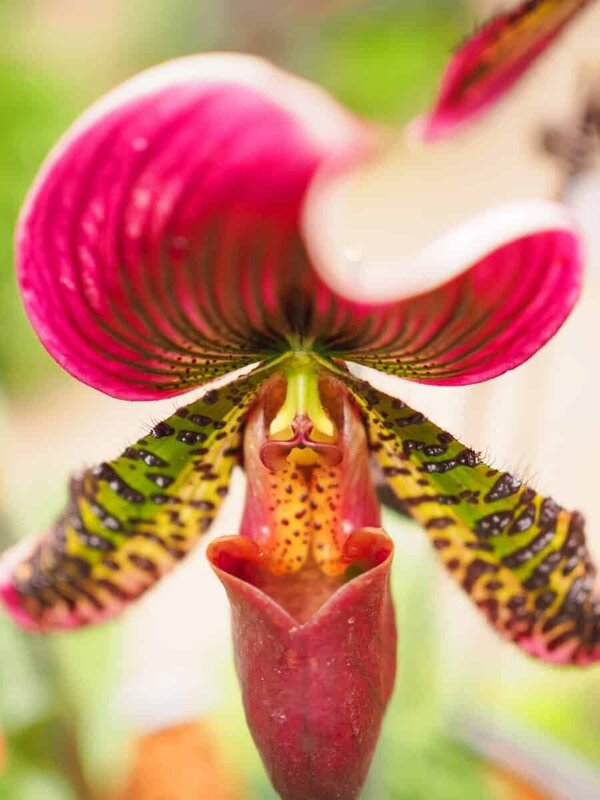 Sure there are thousands of orchards in every colour under the sun but you’ll also find the intriguingly cute yet creepy carnivorous plants, my personal favourite within the National Orchid Garden. This is the place to whip out a 50mm prime lens and capture the details of the flowers in bloom. If you’re lucky there are even fascinating little lizards that roam the gardens, they’re fluro green and latch on to the trees so keep an eye out! If you need a break from the thick Singapore humidity, the orchard gardens have a cool room…you can totally pretend to photograph every single plant in there if you need a break from the heat! 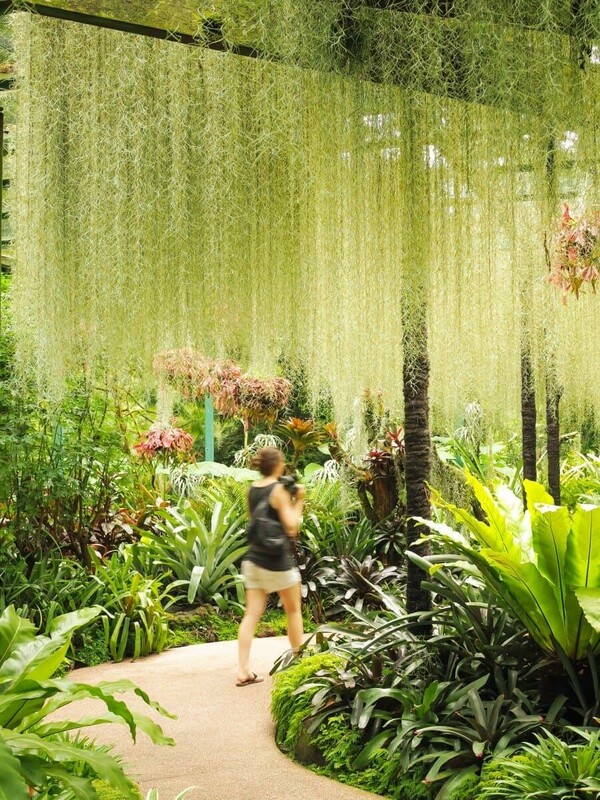 Getting Here: The National Orchid Garden is located within the Singapore Botanic Gardens. There’s a $5 admission fee for adults and $1 for students/seniors, children under 12yrs are free. 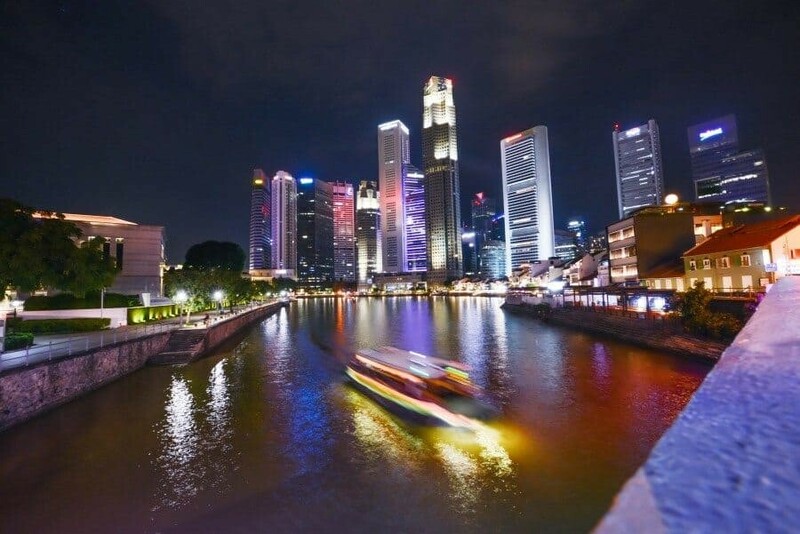 Once the centre for trade, the river front of Singapore is thriving with skyscrapers and shophouses blending together to form a very photogenic skyline. 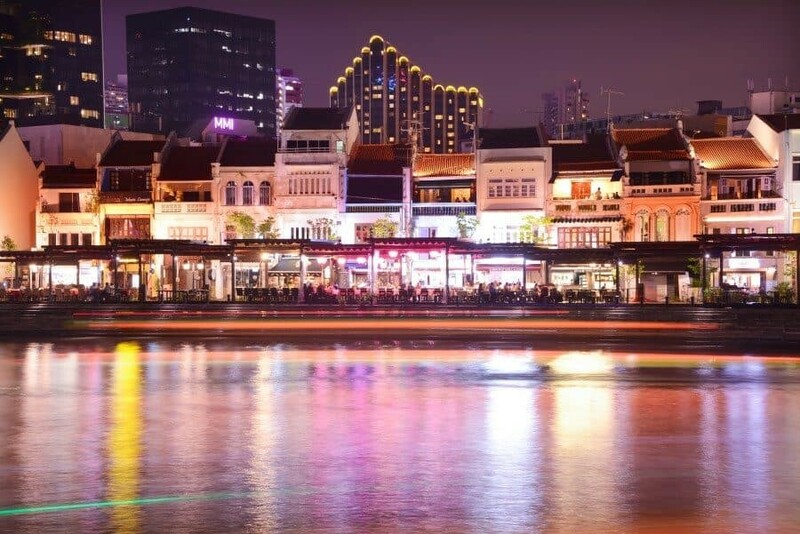 Clark Quay is filled with outdoor restaurants, making it a hub of nightlife and ideal for a wander to capture long exposure shots of the twinkling lights reflecting in the water. 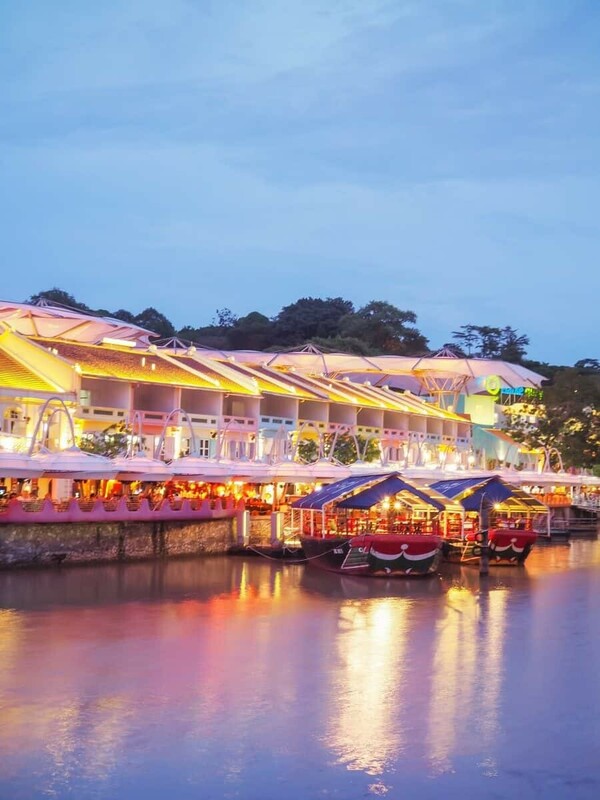 Boat Quay is similar with its evening appeal, the skyline works well in contrasting old and new with colourful shophouses lining the waterfront. It’s possible to walk from Clark Quay down to the infamous Merlion Statue and from here you’ll get a great view across to Marina Bay Sands. This walk takes about 20 minutes along the river front however if you’re anything like me, it can take up to two hours including photo stops! It’s designed like a giant playground for all ages hence the tag line ‘The State of Fun’. Here you’ll find the giant S.E.A Aquarium, Universal Studios Singapore and experiences like golf, iFly and many, many more. Sentosa for photographers however is more about the beaches and lush interior. Thick rainforest is found at the island’s core and the edges are sandy beaches popular with locals looking for a weekend out of the city. 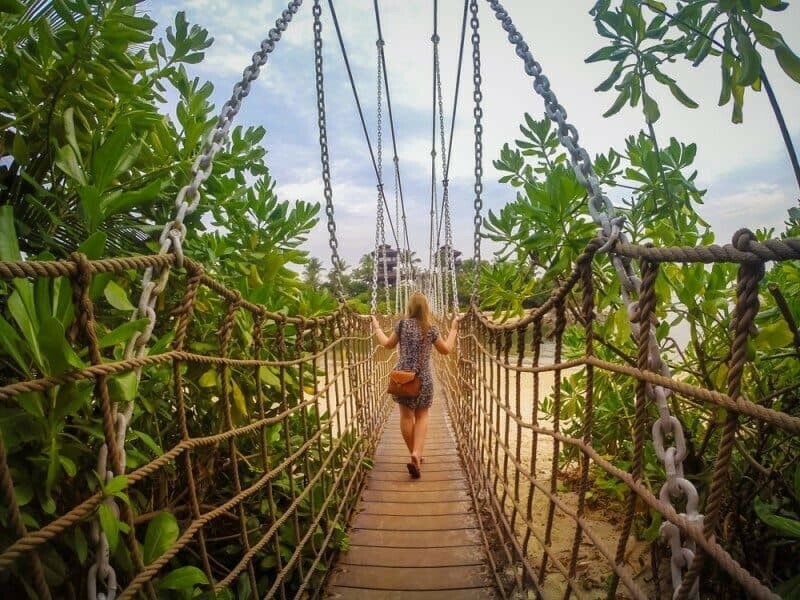 As an Aussie, the beaches aren’t quite up to landscape photography standards however the various coves such as Palawan and Siloso Beach do offer an alternate side to Singapore and a great place to escape the Downtown hustle. If you’ve got a young family and want to keep them entertained this is definitely the place to go. Click here to see the latest hotel discounts on the tropical Sentosa Island resorts! Getting Here: There’s a number of ways to reach Sentosa Island, probably the easiest is via MRT on the Circle or North-East Line to Harbourfront Station. From there you’ll find the Sentosa Station located on the 3rd floor of VivoCity from which you can then travel across to Sentosa and access either Resorts World at Waterfront Station or the beaches at the aptly named Beach Station. More info here. What’s not to love about a half lion, half fish statue that squirts out water from its mouth!? Representing Singapore’s past, the body symbolises the fishing village of Temasek, meaning ‘sea town’ in Old Javanese of which was the beginning of Singapore’s existence. The head gives a nod to Singapore’s original name Singapura, or ‘lion city’ in Malay. 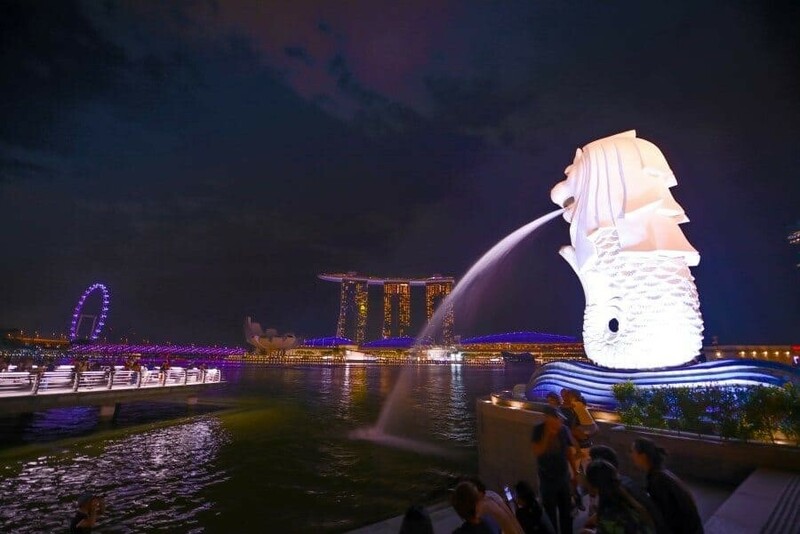 The Merlion statue is super popular with tourists because it’s also located directly across from Marina Bay Sands, offering a fantastic viewpoint of the skyline, especially for the nightly light shows. From the platforms and bridges around the Merlion you’ll find great spots to set up with your tripod and capture the sunrise or evening long exposures as the boats pass by. Getting Here: Raffles Place MRT station is the closest to the Merlion Park and take Exit H in order to end up on the right side of the road. 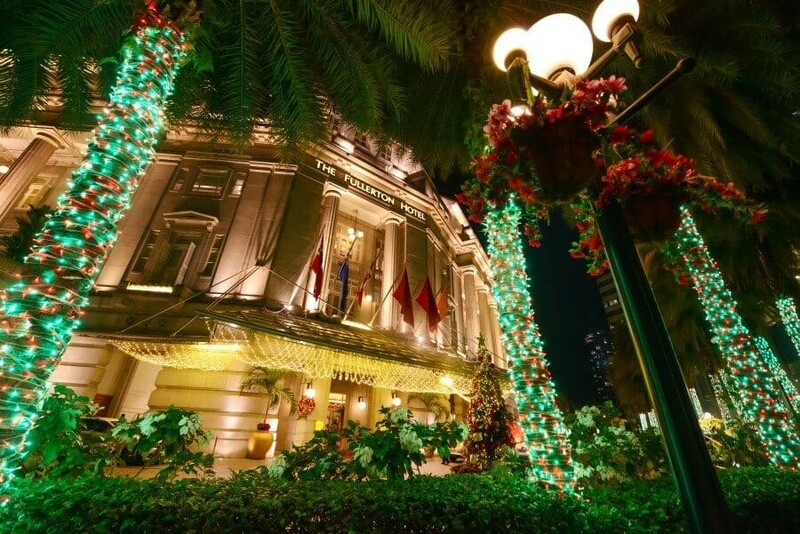 Otherwise you can wander here down the river from Clark Quay, stopping by the historic Fullerton Hotel on the way which looks beautiful around Christmas time all decorated! Connecting the Singapore Flyer side of the river to the Marina Bay Sands side, Helix Bridge is an entwined marvel of construction with handy little photo platforms. At night it’s lit up in bright purple lights that contrast perfectly with the surrounding light shows that happen hourly each evening. Along the bridge you’ll find little look outs where you can stop and set up your tripod to capture the Singapore skyline. 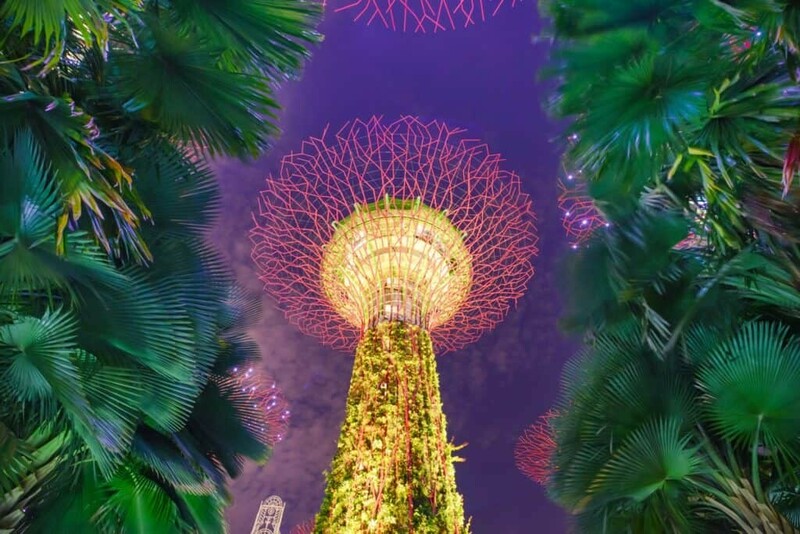 Getting Here: It’s a great walk from the Supertree Grove and Cloud Forest over the Helix Bridge towards the Singapore Flyer. Waterloo Street: With a pedestrian mall and the Kwan Im Thong Hood Cho Temple it’s a great street to wander down with your camera! 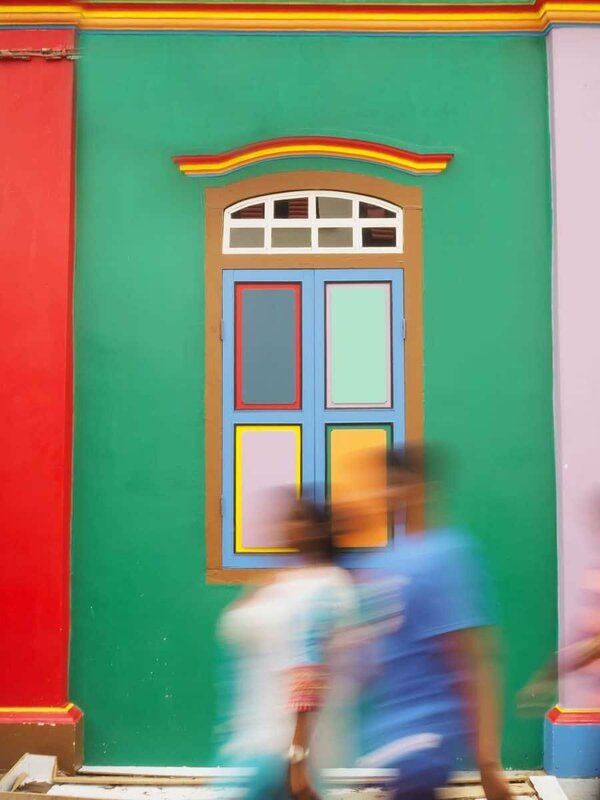 Joo Chiat: Peranakan culture is on full display in this colourful neighbourhood with lots of eateries, shops and heritage shophouses. Mica Building (Old Hill Street Police Station): You’ll probably see the building without even looking! 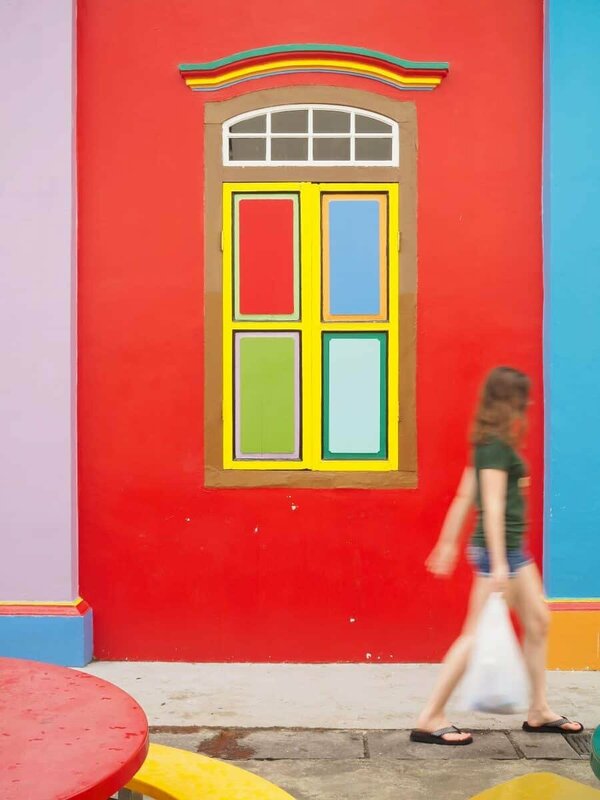 A giant white building with a series of colourful window shutters similar to those of the traditional shophouses throughout Singapore. You’ll find the MICA building on Hill Street just near Clark Quay. 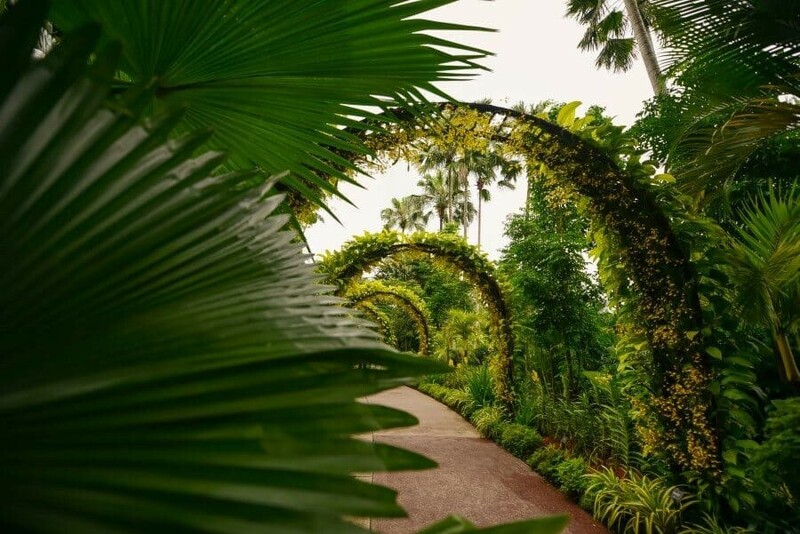 Henderson Waves: Unfortunately I wasn’t able to visit during my stay to capture an image for you but check out this google image search of photos from Henderson Waves…amazing right!? Where to go in Singapore? Check the map below! The map of Singapore photo spots below was created so you know exactly where to find each location mentioned in the guide above. By clicking the map you can open it directly into Google Maps and find each photo spot while travelling around Singapore. You’ll find so many hotels to choose from in Singapore that it becomes more a matter of location than anything. Most hotels are comfortable, stylish, clean and well located so pick which of the photo locations above you wish to be closer to then reserve a room. Singapore is a relatively small city but it’s best to base yourself in the very heart of the action so you can easily catch the MRT around or walk at your own pace to photograph the many sights. I stayed at the fabulous Intercontinental Singapore which I found was the ideal location for exploring the city. 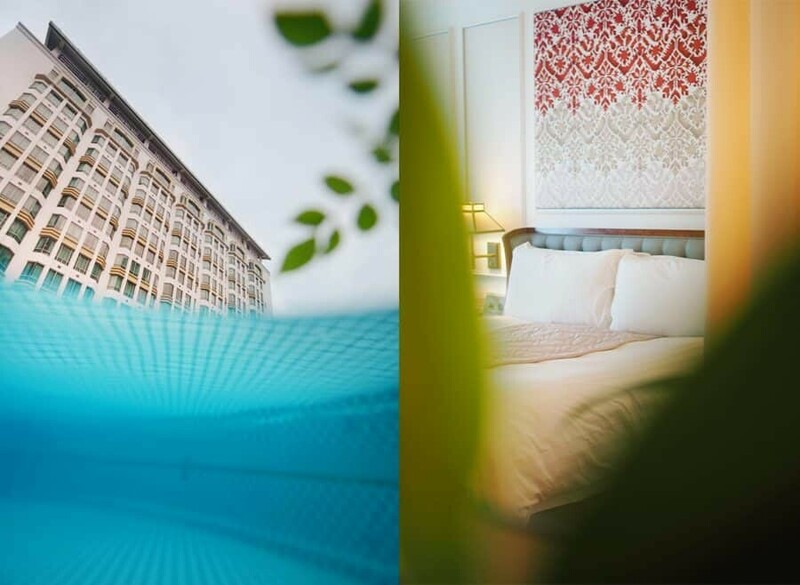 Right next to Bugis MRT station it’s also within walking distance to the Merlion, Clark Quay and Haji Lane…it’s just a block away from the historic Raffles Hotel too! If you’re waiting for cooler conditions then you’ll probably never visit Singapore…it’s warm and tropical all year round. At just one and a half degrees north of the equator it’s humid regardless of the time of year. There is a wet season typically from September to February however it rarely rains continuously for more than two days in a row and it’s more a series of hot, humid days followed by afternoon thunderstorms that go as quickly as they arrive. The thunderstorms also work amazingly well in photos as the big clouds roll over the city…just be sure to get ready with your umbrella when the downpour hits! March to August is known as the dry season but weather in Singapore isn’t the most predictable. 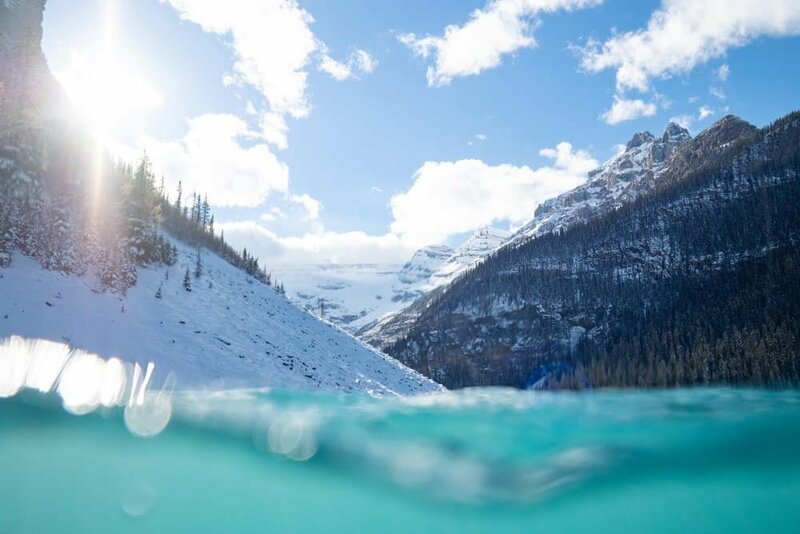 I’ve personally visited in December, January, June and March…each visit had a mix of storms, sunshine and was humid during the day with temperatures varying between 25-30degrees. 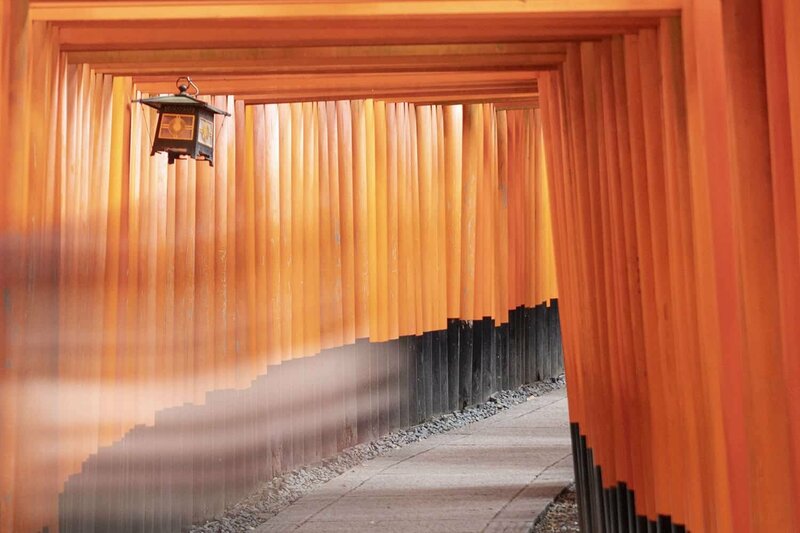 If you’re travelling around Asia be sure to have a read of my photography location guides for Tokyo, Hong Kong and Kyoto. To save this post for later via Pinterest, here’s a photo just for you! I had about a dozen comments I wanted to make as I was reading through this, but now I’m at the end and I’ve forgotten them all. 🙂 GREAT guide! I’m so impressed with all the colors you captured. I hadn’t even realized it until looking at all your photos, but Singapore is definitely more colorful at night than by day! Thank you lovely!! 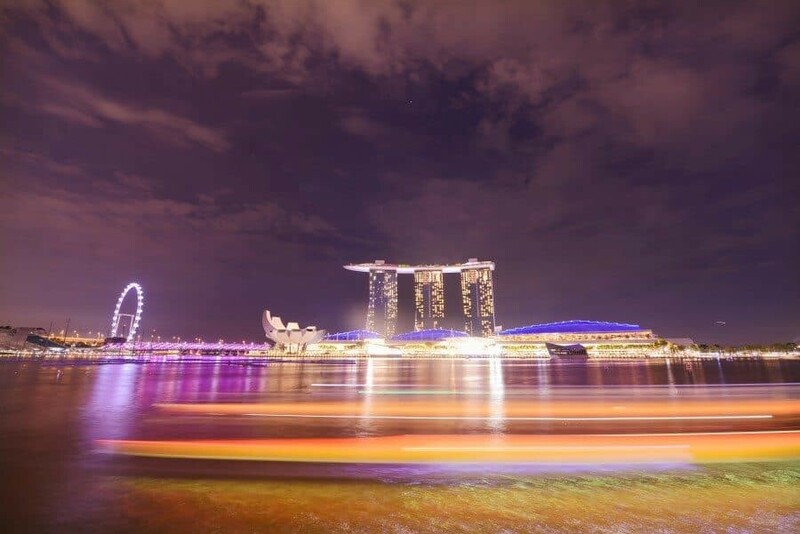 Next time let’s do a Singapore by Night wander…much cooler too haha. Thanks for sharing these tips. My next travel photography trip will lead me to Bangkok and Singapore. I need as much information as possible to plan my schedule, so this guide is perfect for that purpose! You don’t say anything about the weather, is there a time of year you should avoid? We are looking at going in June.Best time of year to go? Hi Sharon, the weather in Singapore is consistently warm. There is a wet and dry season however because it’s a tropical destination there’s the potential for storms and rain at any time. Traditionally wet season is between September and February while dry season is from March to August. You’ll find in the wet season the humidity levels can be quite high so it can be a little unpleasant walking around 🙂 June would probably be a great time to visit! I wish I’d read this before I was there I was there last February! Difficult, being as you only wrote it this year, but I now I have to go back and try again! Fortunately, your Iceland guide covers exactly the territory I’m (re)visiting in October, so that is very helpful. 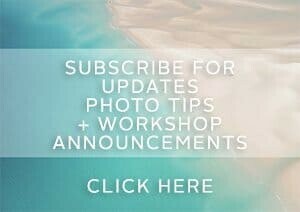 Thanks for sharing these tips.It is a great guide for those who are photography lovers.Will share these with friends. Thanks for this fantastic guide Lisa! I really liked the diversity of locations you chose for Singapore as it really showcases how diverse and unique the area is! A photo app that I’m working on for taking photos at the best spots in Singapore has recently released and I think you’d be interested due to this article! 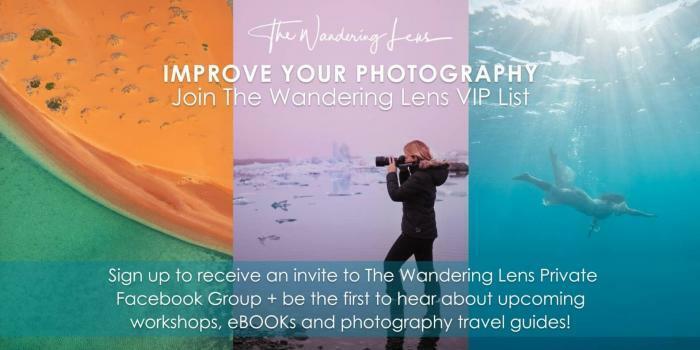 It’s called Explorest – it leads you to Singapore’s most beautiful photo locations using GPS coordinates & tips by the country’s best photographers. We’ll be expanding to California and many more places soon! Check it out if you have some spare time! Thanks for sharing Julien, I had a quick peek and Explorest looks great, so much detail for each location! I’m sure anyone reading this guide will find it really useful. Good luck with the app! I live in Singapore! 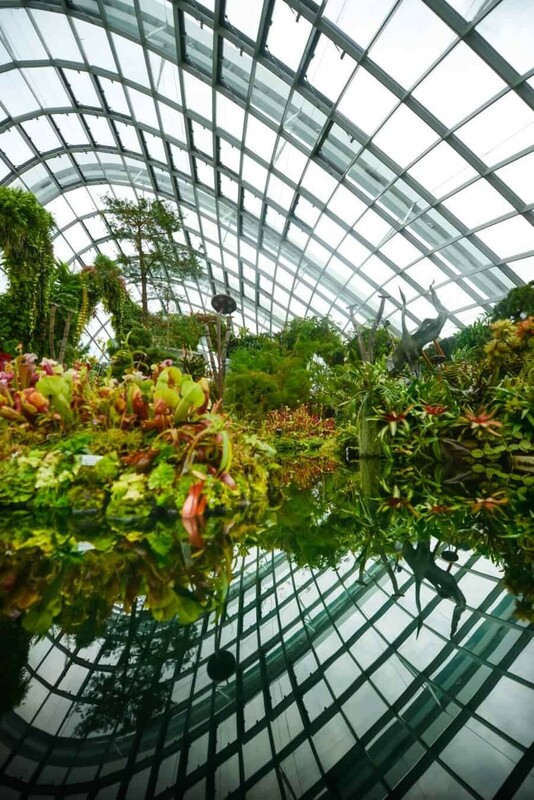 Love your cover photo taken at Gardens by the Bay. I’ve recently tried shooting at the exactly same location at Marina Barrage. For me, the best shooting location in SG is Bay East area (located opposite Gardens by the Bay domes, across Marina Bay). You can easily get there from Marina Barrage by walking 10-15 mins. Hope you’ll try next time! Thanks Joey! Great tip about the Bay East area, I can imagine the view would be beautiful from that side! Next time I’m in Singapore I’ll definitely give it a go. Feel free to get in touch with me if you’re coming! There are a few other less known spots to shoot Singapore CBD skyline (I’m all about cityscape…!). Cheers. Thanks for the all the info. I will be there in about three weeks. So excited. Can’t wait. Do you run photo walks? If so, what types, when and how much? Great to hear John, Singapore is such a cool city, wishing you a great trip! I don’t personally run photo walks as I’m not based in Singapore but I know Olympus actually have photo walk meetups regularly so it could be worth having a peek at Google to see what you can find.